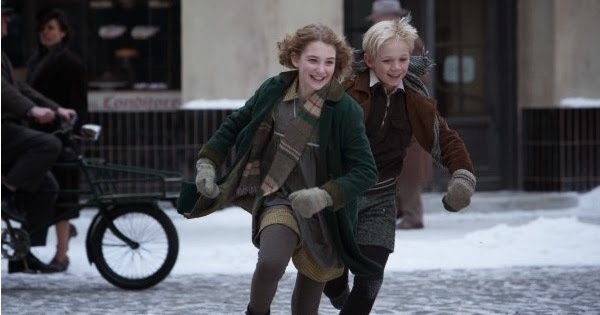 Adapted from the novel by Markus Zusak, The Book Thief charts World War II of a young German girl called Liesel (Sophie Nélisse). It's 1938 and her younger brother is dead, her mother is 'disappeared' Communist - with nowhere else to go she's placed with a non-descript German couple, Hans (Geoffrey Rush) and Rosa (Emily Watson). After a frosty beginning the three form a close-knit family unit, growing together as Europe tears itself apart. As the years tick by Liesel gets an abridged version of the domestic German experience during the war; witnessing book burnings, her schoolmates becoming indoctrinated into Nazism, Jews having their shops ransacked and bundled into cars and the men in her life gradually being conscripted into the Nazi war machine. The most notable development is the arrival of Max (Ben Schnetzer), the Jewish son of an old war buddy of her adoptive father. The family hide him in their cellar and soon he and Liesel form a strong friendship, Liesel reading to Max from banned books she's appropriated from book burnings and private libraries and Max gently encouraging Liesel to express herself creatively through her writing. For much of The Book Thief the war seems a distant concern. It's something you hear reports of in the newspaper, but the propagandist stories give little real insight into what's going on in the outside world. This puts Liesel's picturesque town in a bubble, a close-knit community where Nazism is an alien invader rather than something that's naturally sprung up within the community. Pervical's film softly paints a picture that comes close to absolving the average German citizen of responsibility for the rise of Nazism. The majority of the townspeople we meet in this movie are kind, intelligent and understanding, most of them apparently secretly opposed to Adolf Hitler but intimidated into stepping into line and subsequently into uniform. The only 'true believers' we meet are obvious villains, cartoon pastiches of cruel bullies. While the Nazis obviously were cruel bullies The Book Thief presents us with an reductively Manichean world. In this film Nazi indoctrination becomes something that happens to other people, as opposed to the reality that racist, xenophobic, totalitarian fascism is something that, given the right conditions, can take deep root inside every human being. Fortunately what the film lacks in narrative subtlety it more than makes up in careful visual storytelling. From the opening shot of clouds we quickly swoop down to following a train travelling through a snowy white field, white steam billowing from the smoke-stack. All too often these characters are surrounded by pure white snow, piled in heaps on the ground and gently fluttering down from the sky around them. This snow is the psychic echo of the pillars of ashes emanating from the ovens of Dachau that, unbeknownst to these townspeople (and certainly to the young Liesel), are burning not so far away. With the snatching of Jews from their shops, and later ragged, emaciated concentration camp victims marching down the street, they sense that something is deeply wrong but lack the information to articulate it - this unfocussed yet keenly felt guilt drifting in their streets, clogging their gutters and freezing their rivers. Much like young Liesel, the film has it's heart in the right place yet occasionally struggles to articulate itself. From Death's opening lines we're know we're building to a morbid conclusion yet we get there by a frustratingly circuitous route: the film is never dull exactly but it comes perilously close. This largely a structural symptom, there's a few different mini-plots going on at once, and as these end there's pauses in the action where nothing much of interest is happening. Geoffrey Rush is one of a very small group of actors who can retain our sympathy while dressed in a Nazi uniform. Preventing this stop-start narrative technique from torpedoing the film are the excellent performances throughout, with particular praise due to Geoffrey Rush's ultra-paternal Max - a rock of warm humanity within the nightmare of fascism. Emily Watson also impresses as the gradually thawing Rosa, effortlessly morphing from evil stepmother to nobly pragmatist. Roger Allam is a decently ambiguous Death (though his intonation distractingly recalls The Stanley Parable). But it's Sophie Nélisse that deserves the real plaudits, believably portraying the lead character over multiple years - somehow physically embodying every single stage of adolescence. The only real problem with the performances is that there's the disappointing decision to have our leads speaking English with wobbly German accents rather than just speaking German. Annoyingly they decide to pepper the dialogue with the odd German word ('Ja' and 'Nein' instead of 'Yes' and 'No etc), as if they're scared we'll forget this is taking place in Nazi Germany (the omnipresent Swastikas kind of give it away...). Even more bizarrely they're not consistent about it, so some characters speaking in subtitles and some don't. This isn't so much of a problem when you're properly engaged in what's on screen but it definitely undercuts more than few dramatic moments. Nobody is going to argue that the central message of the importance of books and how they teach you to viewing the world through a poetic questioning lens isn't a vital one, yet in my opinion it's a touch too vague, too fluffily humanistic to act as a true riposte to the horrors of Adolf Hitler. That said, the muffled sniffles from the audience as the credits roll is testament to the film at least succeeding on a emotional level.